Dr. John Michels is awarded as a Texas Rising Star by Super Doctors seen in Texas Monthly second year in a row. By strict selection process he is listed as one of the states top providers in his field. He expresses great honor and gratitude for being selected for this award. Dr. Michels is a former First Round Draft Choice and Super Bowl Champion with the Green Bay Packers. After an injury ended his NFL career, Dr. Michels was accepted to the University of Southern California Keck School of Medicine where he went on to become a Dean's list scholar and a member of the medical school admissions committee. After medical school, Dr. Michels went to Baylor College of Medicine where he completed a residency in Diagnostic Radiology. He then went to UC Irvine where he completed an ACGME accredited multi-disciplinary fellowship in Interventional Pain Management. He is double board certified in Diagnostic Radiology and Pain Medicine. 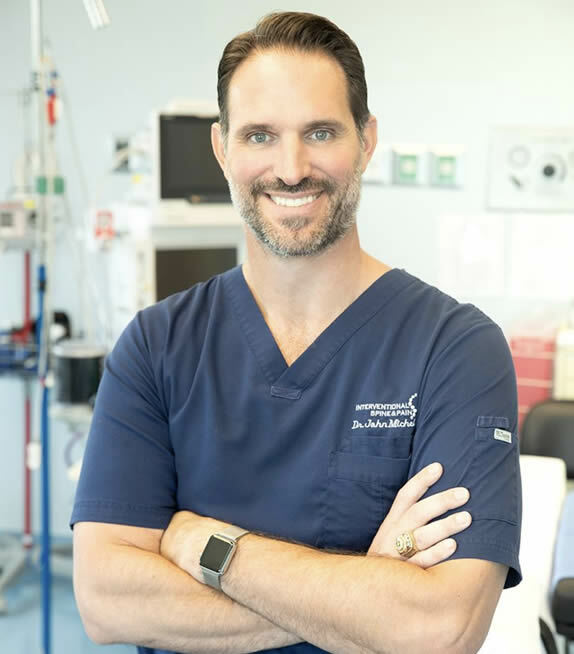 Dr. Michels' passion is to use minimally invasive image guided procedures to help minimize pain and restore function so that people can live their lives to the fullest. "I went to Dr. Michels because my herniated disc was causing me significant pain while doing daily activities and more importantly, I could no longer dance! In less than 3 months, after 2 injections and guidance from Dr. Michels, I recently attended a family wedding and danced until my feet hurt! Thank you Dr. Michels for your expertise and your compassionate soul!" "Experiencing pain on a daily basis, is no walk in the park. This Doctor is amazing, he understands your concerns and incredibly knowledgeable about helping you through as though you are his only patient.. I cannot say enough praises about Dr Michels and his great staff.! So far above most medical offices. They deserve more than 5 stars!" "I've been seeing Dr. Michels for a few months, and he has been fantastic! He spent an unusually long time with me the first time he saw me (which in itself is unusual for some doctors these days). He has answered every question I've asked in a way I can understand, he is very knowledgeable, is very friendly and easy to talk to, and seems interested in helping me the best way he can in whatever way is best for me. I've been very impressed with him both as a doctor and a person." "Dr. John Michels is the most effective and caring doctor I have ever encountered. I was suffering from periformus syndrome which caused severe nerve pain stemming from my lower back down both legs. Not only were four previous doctors unable to help me, but they were unable to even properly diagnose my condition. Upon my first visit to Dr. Michels, he was able to identify the problem and set up a plan to successfully treat me. After years of pain and depression, joy has returned to my life." "Dr Michels was recommended by my neurologist and I can't say enough good things about him. He is very caring, compassionate but most of all listens to what you're experiencing. He performed an epidural injection on me and it has helped the pain. He is a very good doctor and I would highly recommend him to anyone."